The legend** goes that Bacchus descended one day in disguise upon the slopes of Mount Massico where he met a poor and simple farmer of the surname Falerno. He did not hesitate to offer his unexpected guest the best from his pantry. Moved by the farmer's generosity, Bacchus transformed his cup of milk into wine. Falerno drank deeply and fell into a long sleep. Upon his awakening, his land was covered in blooming vineyards. The first Falerno del Massico was made with Falanghina and was historically praised by the likes of Pliny, who declared it the best wine of his day. Others such as Virgil, Cicero, and Catullus held the wine in high regard as did the Czar of Russia and Gustav of Sweden. Production Zone: includes the townships of Carinola, Cellole, Falciano del Massico, Mondragone and Sessa Aurunca, all in the province of Caserta. The wine can also have a varietal declaration only for Primitivo. In this case, it must be written on the label and the blend must be a minimum of 85% Primitivo with a maximum of 15% Aglianico, Piedirosso, and/or Barbera, minimum alcohol 13%, minimum AGING 14 months. Vecchio: can be used interchangeably with "Riserva," but only for Primitivo. In Falerno del Massico, which is close to the dormant Roccamonfina volcano and the solid calcerous terrain of Mount Massico, there is a movement toward softer wines. This is true of the white and red based on Primitivo. If properly vinified, Falerno del Massico rosso can be soft and structured with a complex aroma. These qualities make it particularly suited for meat dishes and aged cheeses. Wine made primarily from Primitivo is highly structured as well, but extremely extracted and high in alcohol. This makes the wines perfect pairings for roasted meats, as well as meats prepared with sauces. The whites are lighter and more acidic and are perfect with pasta and tomatoes, as well as other simple and aromatic dishes. **Something fun I found whilst poking around the internets. I had to share it. Just an additional note on the history of the grape...as stated below, it is widely believed to come from the Pinot or Greco family, but some sources conclude otherwise. Some maintain that it comes from a wild native variety domesticated by the Etruscans living in Capua (a city in the province of Caserta). It has similar etymological origins as some of the primitive Lambruscos (Aspro and Cruet) and was cultivated in the same way (vines trained to live supports such as trees, in the case of Asprinio, poplar trees) as many of the Lambruscos from the Po River Valley. So there. Characteristics: average to small leaf that is smooth with 5 lobes; light green in color; Grape bunches are average in size, compact, long and conical, can produce or not produce wings. The grapes are on the larger side of average with a grey-green color and have an abundant bloom coating. **Please click here to see the previous post which explains in greater detail what this type of vine training is. Neapolitans are so proud (SO. PROUD.) to call this one of their many regional gifts to the world. A slice the size of a ham steak is but a snack, incapable of adding girth to the thighs of anyone and in fact, is nothing less than a nutritional miracle. Just ask any mamma italiana. "A taste is worth more than 1000 words." Sure is. Mozzarella in Carrozza (mozzarella in a carriage) is the name of a dish prepared like this: put a generous slice of fresh mozzarella between two slices of bread, dip it in flour and egg, then pan-fry. One can only imagine the crunch which gives way to the soft, fragrant and gooey interior. Mamma mia! And it just begs for a simple glass of high-acid, Aversa DOC. Enjoy. Alberata or Vigneti ad alberata: wines made in the Aversa appellation using grapes obtained from vineyards planted using the alberata aversana method must include Alberata or Vigneti ad Alberata on the label. The production area, which includes 22 townships in what used to be Liburia,** is identified by its Asprinio vineyards trained to poplar trees, which act as stakes or supports for the vines. This method of pruning creates large green walls that can reach up to 15 meters [roughly 45 ft] in height. This white grape variety, by name, reveals its distinction among other grapes--its intense acidity. If great care isn't taken in the vineyards and the winery, the acidity can become too aggressive. The problem with most producers of this wine is that they source their grapes from growers and are therefore unable to intervene in the vineyards to help improve the quality of the end product. This unique style vine training is of Etruscan origin. 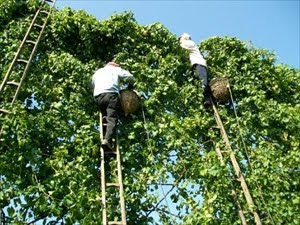 Although it is striking to behold, pruning is extremely difficult at the tops of the plants. Asprinio is also used in the production of passito (dried-grape wine) in the appellation Terre al Volturno IGT. **Liburia is the ancient name for the area known today as Terra di Lavoro (Southern Lazio and Northern Campania). The Latin name is derived from the word Leborini who were an ancient tribe that inhabited the area. The modern name, Terra di Lavoro means "land of work." As long as I lived in Campania, I was always intrigued by the areas of Irpinia and Sannio. They are rich with an ancient history of Oscans, Samnites, and Hirpini that I find fascinating. The mountains of Irpinia, set with pine trees and chestnuts are ones that I hope to have to opportunity to explore in depth sometime in the future with my DoBianchi. Production Zone: includes all areas adequate for grape growing in the province of Avellino. Other types: Passito from Greco and Fiano with a minimum of 7 months aging and alcohol at 12.5%; Classic method** Spumante using Fiano and Greco with a min alcohol of 11.5% is released after 20 months from October 1st of the most recent harvest year. Campania has been awarded with a new DOC, the 17th in the region and the only DOC in the province of Avellino. Irpinia has always been a land rich in vineyards. 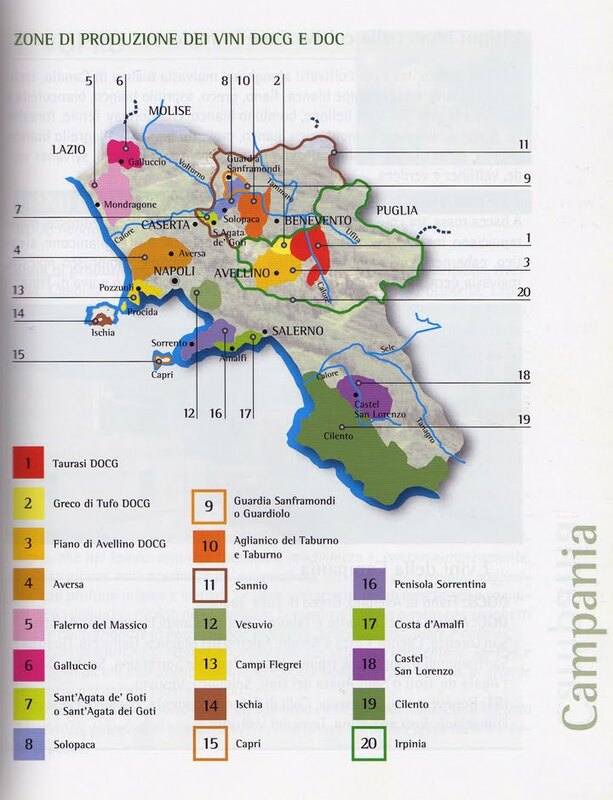 The appellation is divided by the Apennine mountain range that runs from the Tyrrhenian Sea to the Adratic Sea. Its land possesses a unique, mineral-rich volcanic soil. Because of this, and the climate which varies from one zone to the next, from its origins this appellation has been capable of producing the great wines long exalted by historians and poets alike. Irpinia DOC, beyond having the task of raising awareness of the viticultural value of the appellation, also serves as an umbrella DOC for the three already recognized DOCGs of Taurasi, Greco di Tufo, and Fiano di Avellino. **Classic/Traditional Method (Metodo Classico, in Italian) or Methode Champenoise is the process by which fermented wine is placed in a bottle with added yeasts and sugar to induce a second fermentation. As the wine ferments, carbon dioxide is created. It is dissolved throughout the bottle and escapes, creating bubbles when the bottle is opened. This is quite labor intensive and results in a wine with much more complexity than one created using the Charmat Method (wherin 2nd fermentation takes place in large vats). Text below translated from: Del Canuto, Francesco et al., Il vino italiano, vitigni, enografia, e grastronomia regionale, Associazione Italiana Sommeliers (Bertani & C.), Milano, 2010 (2002), fourth edition. Cultivation Zone: Basilicata, Campania; Some is found in Apulia and Molise as well. Aglianico produces wine with a ruby color with hints of garnet. With age, it tends toward brick red. The nose is intense with pronounced aromas of cherry preserves, plums, almonds, violets, spices, and suede. The flavor is rich and tannic, given to good structure and a very long finish. **If you missed it before, here's Jeremy P's research on the real origins of the grape name. Debunking happening daily over at DoBianchi! ***Bloom (pruina in Italian, in case you were curious) is the powdery substance on the skin of a grape. It contains protective waxes, bacteria, and yeast cells that are native to the vineyard. This substance is also found on the skin of blueberries. 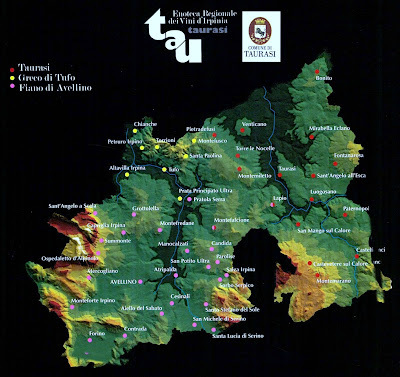 Even though I lived in Campania for nearly four and a half years, I didn't get to drink a ton of Taurasi. It was relatively expensive and I lived a pauper-ish existence. I'm sure that I've had more than even your average Northern Italian, but still, I am far from an expert. I did drink lots of Aglianico (Sannio DOC, Irpinia DOC, Taburno DOC, many IGTs) and Piedirosso though, but we'll get to that soon. Text below translated from: Del Canuto, Francesco et al., Il vino italiano, panorama vitivinicolo attraverso le denominazioni di origine, Associazione Italiana Sommeliers (Bertani & C.), Milano, 2010 (2002), fourth edition. Production Zone: including the townships of (only the the hilly areas with adequate sun exposure, and with the absolute exclusion of humid valley floors and shaded portions of land) Bonito, Castelfranci, Castelvetere sul Calore, Fontanarosa, Lapio, Luogosano, Mirabella Eclano, Montefalcione, Montemarano, Montemiletto, Paternopoli, Pietradefusi, Sant'Angelo all'Esca, San Mango sul Calore, Taurasi, Torre le Nocelle and Venticano, all in the province of Avellino. Excellent wine production in this area is a result of the perfect balance between climate, grape variety, and volcanic soil. Low yields and high-density planting along with attention in the vineyards and use of barrel aging guarantee a high-quality product. Most importantly, there are some emergent winemakers who, with a great deal of professionalism, are exploiting the great potential of Aglianico in this appellation. The color of Taurasi, when released, is an intense garnet with a nose rich in red fruit preserves, black pepper, liquorice, minerality, and tobacco. Very structured with a long finish, this wine is dry and balanced with pronounced tannins. Taurasi goes well with grilled meats and roasts as along with wild game. It is particularly suited for wild boar and aged cheeses. In my next post I will translate the entry for aglianico from volume 2A of this series. This book lists all of the grape varieties of Italy alphabetically, with an informative entry on each. Woohoo! **PLEASE read DoBianchi's scholarly post on the origins of the name "aglianico." Very interesting stuff. That's my man! ***I know that many a Taurasi out there can gracefully age for much longer. I believe that the authors of this book are referring to an average example of the wine and its very average potential. I am but a translator. Greco di Tufo is one of my fave whites from Southern Italy. It's fresh and zesty with minerality, which equals, in my book, absolutely delightful wine. Unfortunately, it's hard to find clean wines from Campania, at least in Texas. Maybe that will change. A girl can dream. The production zone for Greco di Tufo is in the heart of Irpinia. ** In this region one finds sulfur mines, tufo quarries, and a land of vineyards alternating with forests. A young Greco di Tufo pairs well with raw shellfish, baked fish, dried pasta with vegetable sauces, spaghetti with squid ink or shellfish, and flavorful side dishes such as eggplants and broccoli raab (HAY!). When the wine is more mature and rich in personality, it can be paired with grilled mackerel, fish stew, and generally more elaborate dishes. The spumante, made in the Martinotti (Charmat) method, is also very pleasant, aromatic, and interesting. **The name of the region, Irpinia, is taken from hirpus, the Oscan word for wolf. The Oscans were from Umbria and their language was the language of Southern Italy under the Roman republic. I pretty much ripped this from Wikipedia, so if you find this history as fascinating as I do, just mosey on over to the site to dig deeper. Or just ask my DoBianchi, he probably already has a doctorate in it. ***You must know that this was difficult to translate. I mean, as in gritting my teeth over the woodiness of it all. I, in no way support beating greco over the head with barrique and malolactic fermentation, but we all know that it is a trend in Italia (that NOT all follow!) to make a wine "important" by aging it in wood. You can see old rant here. I hope the trend will pass. Until then, I will. Before I get into the translation, I just want to mention that I don't like Italian tasting notes. I feel a blog post coming on, but I'll save that for later so that you don't accuse me of editorializing when I said that I wouldn't. Because the descriptors in the text do not convey the complexity of a good Fiano di Avellino, I have to add that I always found an intriguing herbaceous note in the wine reminding me of the pine forests that surround the area. In addition to citrus, there is typically a pronounced minerality. They can also be slightly nutty at times, but only the special ones. Just like us. Production Zone: including the townships of Aiello del Sabato, Atripalda, Avellino, Candida, Capriglia Irpina, Cesinali, Contrada, Forino, Grottolella, Lapio, Manocalzati, Montefredane, Mercogliano, Montefalcione, Monforte Irpino, Ospedaletto d'Alpinolo, Parolise, Pratola Serra, Salza Irpina, San Michele di Serino, San Potito Ultra, Santa Lucia di Serino, Sant'Angelo a Scala, Santo Stefano del Sole, Sorbo Serpico and Summonte, all in the province of Avellino. Fiano di Avellino, taken from the eponymous grape variety, is one of the most distinguished wines of Campania. With time, the wine acquires depth and softness. Fiano is pale in color with an intense nose of fruit. Its balanced notes of citrus and acidity pair well with dishes such as spaghetti with fresh anchovies, grilled fish, seafood stew, baked fish, pizza, and calzones. Some producers are late-harvesting as well as creating passitos, some are even using grapes affected with botrytis. These are still rare, but very interesting. Sparkling wines made from Fiano using the Martinotti (Charmat) method are pleasant and zippy, and are perfect as an aperitif. **It is commonly believed that the original name for Fiano was Apianum, derived from Vitis Apiana, which was a reference to the high sugar level of the grapes and the bees' attraction to them. (Ape, pronounced "AH-pay" is the Italian word for bee, derived from the Latin "Apis.") Vitigni d'Italia disputes this, claiming that the actual origin of the word is from Appiano which was a variety of apple grown in Apia (now Lapia) near Avellino. B'oh!